Chapter 6 spoke about the surety of God’s promise He gave about Christ; “you are a priest forever after the order of Melchizedek”. God swore on oath to it by 2 unchangeable things: Himself, and His Name. Now the writer helps us understand a bit more about this man Melchizedek who resembles Christ. For this Melchizedek, king of Salem, priest of the Most High God, met Abraham returning from the slaughter of the kings and blessed him, 2 and to him Abraham apportioned a tenth part of everything. He is first, by translation of his name, king of righteousness, and then he is also king of Salem, that is, king of peace. 3 He is without father or mother or genealogy, having neither beginning of days nor end of life, but resembling the Son of God he continues a priest forever. The author reminds us that the Levites (who were descended from Abraham) were required by God to take a tithe from the people, who were also their brothers. It’s important to note that it was the Levites equals (their brothers) who they took the tithe from. When they took it, they offered it up to God by way of provision for the Tabernacle, which was later the Temple. When Abraham tithed Melchizedek it was out of homage to his rank as priest and king. The author shows us that because Levi came from Abraham it was like Levi, himself, offered this tithe to Melchizedek, showing that his office is higher than theirs (even though Abraham’s descendants are the ones who would inherit the ‘promises’). The underlying point being made is that there were infact other priesthoods outside of the ‘chosen nation’ of Israel. There were many mentions of others prior to Abraham such as Enoch (Gen. 5, Heb. 11:5), Noah (Gen. 8:20, Heb. 11:7), and Moses’s father in law Jethro (Exodus 3:1, Ex. 18:12). Noted in verse 7 is that the greater always blesses the lessor, and in the Genesis account we read that Abraham was blessed by Melchizedek. Melchizedek is being labeled as the superior here because of the testimony about the Levitical priests continuance by birthright and Melchizedek’s singular priesthood due to non-genealogy (verse 8). 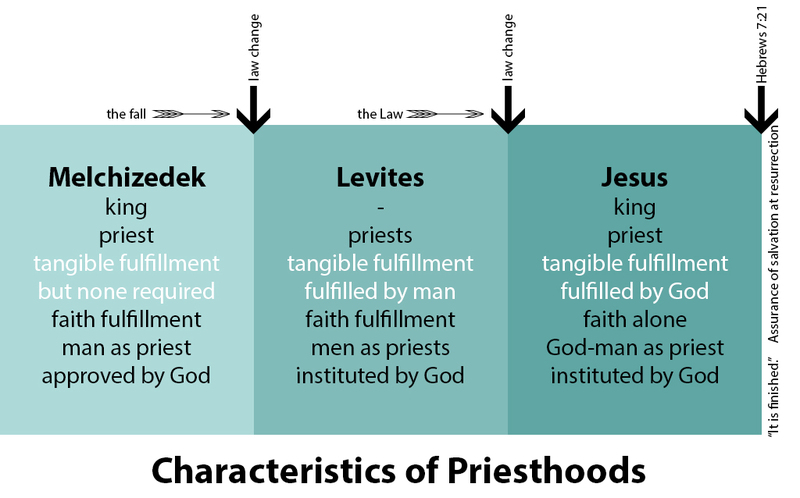 Now we reach a critical question – Why would there be a change in the way the priesthood works from Melchizedek to the Levites and then from the Levites to Jesus (who is called by God a ‘high priest forever’)? Verse 11 reveals that the former priesthoods of Melchizedek and Levi were faltered in that they were unable to fulfill the entire requirement set forth by God. They were never able to perfect the priesthood because it was unattainable. Each time the way the priesthood worked changed, the Law given by God also changed. From creation to the Levitical priesthood there was no ‘specific’ genealogical priesthood, nor was there a set order of laws laid out by God for mankind. Upon the commencement of the Levitical priesthood God laid out His Law, as well as the rules and regulations for worship that the priests would adhere to. Then from the Levites to Jesus the priesthood was finalized and the Law was fulfilled (see the graph below). In both Melchizedek’s and Jesus’ case, they did not come from a line of priests but they were acknowledged by God to be priests. Melchizedek was recognized by God as a high priest by the record of him in the Bible (written ultimately by God). Jesus was recognized as high priest by God in Psalm 110:4, quoted below in verses 17 & 21. Verse 18 explains that the command given by God about the priesthood being held by the Levites was set aside for the ushering in of Christ because it was unable to attain salvation for those to whom sacrifices were made. God set out the requirements of the Law and priesthood as an unattainable requirement to expose our need for Christ who would be able to fulfill not only the Law but the priesthood as well. Through Jesus (who was raised to life and now sits at the right hand of God) we are able to by fully atoned for and pardoned from sin, as well as freed from the slavery of that sin because of His permanent supplication before God on our behalf. This gives us the ability to draw near to God on a daily and even momentary basis. Whereas the first two types of priesthoods were ‘tangible’ in nature on behalf of the person seeking atonement, the priesthood and office of Christ for atonement is by faith and faith alone in Him. Sacrifices and tithes were part of the requirements to fulfill God’s requirements in the past, but now all He requires is volitional belief in His Son. In what ways do I try to take matters into my own hands to appease God? 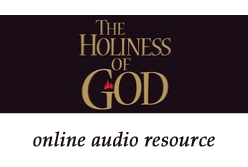 Does God require me to do anything to solidify my salvation? 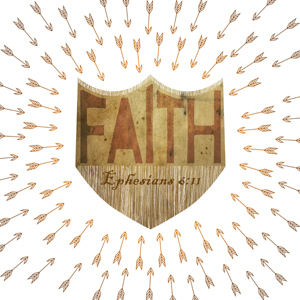 Ephesians 2 talks about our state prior to God’s revelation of Himself to us. We were ‘dead’ in our sins and trespasses, considered enemies to God, when He made us alive together with Christ. It is by His work that we are saved and sanctified, not by any merit or work or continued reach for salvation. His sacrifice was sufficient once for all. And you were dead in the trespasses and sins 2 in which you once walked, following the course of this world, following the prince of the power of the air, the spirit that is now at work in the sons of disobedience— 3 among whom we all once lived in the passions of our flesh, carrying out the desires of the body and the mind, and were by nature children of wrath, like the rest of mankind. 4 But God, being rich in mercy, because of the great love with which he loved us, 5 even when we were dead in our trespasses, made us alive together with Christ—by grace you have been saved— 6 and raised us up with him and seated us with him in the heavenly places in Christ Jesus, 7 so that in the coming ages he might show the immeasurable riches of his grace in kindness toward us in Christ Jesus. 8 For by grace you have been saved through faith. And this is not your own doing; it is the gift of God, 9 not a result of works, so that no one may boast. 10 For we are his workmanship, created in Christ Jesus for good works, which God prepared beforehand, that we should walk in them. Tags: application, Book of the Law, christianity, faith, high priest, Jesus, Levites, Lord, Melchizedek, Old Testament, priesthood, Religion and Spirituality, Righteousness, sacrifice, salvation, sovereignty, theology. Bookmark the permalink.